The streets of Aspire Park turned into a bobbing mass of color on Saturday afternoon as more than 6,000 people came together to show their support for the environment by taking part in the 12th Al Dana Green Run, setting a new attendance record in the process. Organized by Doha Bank and supported by Qatar Olympic Committee, Qatar Red Crescent, Public Security, Traffic police and Aspire Academy, the annual run is one of the most keenly anticipated community events in Qatar, and excitement levels soared to new heights this season as families and fitness enthusiasts from across the city turned out in their droves to support the event and be part of the pulsing community atmosphere the Green Run so uniquely offers. Chief guests in attendance included Mr. Talal Mansour Al Abdulla, General Secretary Athletic Federations, Olympic Committee, Mr. Abdulla Al Khater, Head of Events in Aspire Logistics and Mr. Ali Al Mansouri, Khalifa Stadium Manager. Participants were divided into eight race categories – including Below 18 Male and Female, 18-35 Male and Female, Above 35 Male and Female, Professional Athletes and Special Needs participants – and included a broad mix ranging from eager first-time runners to regulars who keep returning faithfully to the event each year, among them professional runners as well as active green campaigners. The 18-35 Male category attracted the highest number of participants at 2106 , while 58 runners participated in the Special Needs category. Cash prizes were awarded to the top 5 finishers in each category, with first-place winners in each of the all categories. 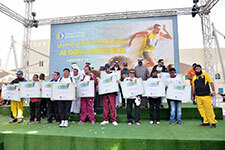 More than 100 winners of Al Dana Green Run won prizes. 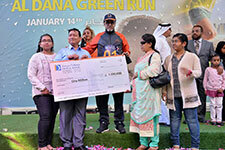 “We are proud to see the popularity of the Al Dana Green Run go from strength to strength over the last 12 years. As an organization dedicated to supporting the cause of environmental protection and sustainability, while contributing to Qatar’s National Vision 2030, we are pleased to have brought another successful edition of this much-awaited social event to the people of Qatar. I would like to thank personally all the Doha residents who came out in support of this great initiative organized with an overarching objective to encourage communities to embrace an active lifestyle and also care for the environment,” said Dr. R. Seetharaman, CEO of Doha Bank. Doha Bank employees also showed their support to their organization’s initiative promoting wellness and green living. Mr. Dharnedra Kothari and his son Taksh Kothari, aged 8, joined this edition’s run, “I’m very proud to be part of this great event and to be able to actively involve my son. It is vital to educate kids from a young age to adopt an active lifestyle as on top of being fun is rewarding for their wellbeing.” The Al Dana Green Run is organized annually by Doha Bank to spread awareness among the people about the importance of environmental protection and to encourage them to adopt sustainable practices to maintain a better ecological balance. The 12th edition of the community run kicked off at 3pm at Aspire Park and covered a 3-km circuit around Khalifa Stadium. The event saw more than 6,000 participants gathered to run as well as cheer on the runners and soak in the carnival-like atmosphere, which included a lively photo booth area, where the crowd posed for fun polaroid pictures, which were shared on Instagram and Snapchat with the #danagreenrun. There were cutouts boards for male, female and kid runners, which were used by participants for taking creative photos. Also fun activities for children were on offer, like face painting and balloon twisting in addition to cartoon characters. Not to mention the outstanding live performances of the kids of Birla Public School and Philippine School, who presented respectively a mime show about green living and saving the planet and live musical shows featuring recycled instruments. With the weather remaining perfect, the venue at Aspire Park offered a lively outdoor setting for the crowds to enjoy a fun-filled day out, with live DJ set and musical performances ensuring the mood remained festive throughout. Complimentary refreshments were provided for the runners and the crowd, courtesy of Doha Bank, along with Krispy Kreme doughnuts, muffins from The Torch Doha Hotel, water bottles supplied by Lulu Hyper market & Aquafina water from Ali Bin Ali. This season’s event was also the venue for the 9th and 10th monthly draws of the 2016 campaign for Al Dana Savings Scheme, Qatar’s most popular savings account. Held amidst a whirl of bustling excitement, the draws witnessed two more Doha Bank customers – Mr. Hisham Sarhan and Mr. Santush Kumar Debnath – joining the growing ranks of Al Dana millionaires. Both millionaires learned about their astonishing prize through a live phone call from Al Dana Green Run’s stage courtesy of Dr. Seetharaman while other lucky winners walked away with prizes ranging from QAR 2,000 to QAR 100,000. These included three Young Saver scholarships worth QAR 25,000 each and one prize worth KWD 2,500 offered to a lucky Al Dana customer in Kuwait. 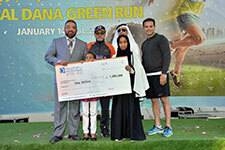 In total, 110 prizes worth around QAR 2,649,000 were announced as part of the draws held during another successful edition of Al Dana Green Run.